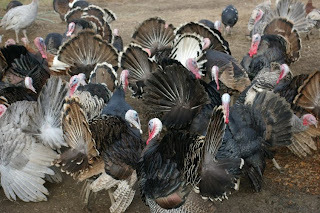 Picture of our turkey flock. They're sure pretty. Our turkey sales are seasonal and we start selling Turkeys in October. To ensure a bird for the holiday, please call us after October 1st and put a $20 deposit down. We'll guarantee a bird will be available for you. You can pick up your turkey at the farm or at a dropoff point in Seattle. We typically do not sell turkey poults or eggs, but if you're interested in a particular species for a breeding project, give us a call.